Alfred Edward Bird was born in Frieston in 1898, the second son of Alfred Edward and Hannah Bird. After leaving school Alfred (junior) as employed by on the farm by W Burke of Templeway House until he was called up. He joined 2nd Battalion, Kings Own Yorkshire Light Infantry on 25th June 1918, trained as a Lewis gunner and was sent to France on 16th October. On 5th November (just 6 days before the armistice) Alfred was hit by shrapnel during the Battle of the Sambre (in which Arthur Parr was also fatally wounded). Bird was seriously wounded; his left leg was amputated and hemorrhage set in on the wounded right leg. He died at No. 20 Casualty Clearing Station at Bohain-en-Vermandois on 16th November 1918 (aged 20) and was buried at Premont cemetery. Alfred (the father) was born in Alnwick and was a farm horseman. Hannah (nee Betts) was from a long-established Frieston family. They married in 1877 and had 4 surviving children before Alfred. As he was much younger than the other children it’s possible he may have actually belonged to one their daughters. 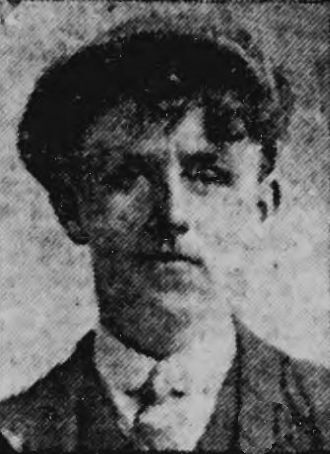 By 1918 Alfred senior had become totally blind and their other son William (a railway porter) had moved to Wakefield where he had a young family, so young Alfred was the family breadwinner until he was called up. In December 1918 a dance, whist drive and collection in Caythorpe raised over £40 for the family. After Hannah died (aged 68) in 1926, Alfred lived alone until his death in 1928 (aged 72). William and his wife Clara had moved back from Wakefield to help look after him. William died in 1944.